On 1 September 2016, the editor-in-chief of Kongres Magazin, Gorazd Čad, gave us something to chew on in his article on self-image, concluding that if a hotel objectively deserves to be called the “best in town”, it does not need a sash or a confirmation in the form of “likes” by a social media campaign. As a proof he used well-established hotels of recognised international hotel chains which in themselves awaken trust. As one of the “Miss title holders” of the Slovenian MICE industry and the main initiator that Sava Hotels Bled apply to the “World Ice-cream index” competition by agency Soolnua, I am presenting my view of the matter and the practical results. Our reality is in complete contradiction with what is said above – Sava Hotels is an independent Slovenian brand and the reason to apply was primarily connected with building recognition and evoking attention, both locally and abroad. In the end, we reaped multiple benefits and despite the competition being already concluded, our ice cream story did not come to an end. How did we tackle the project? Everybody loves ice cream and the story of promoting MICE destinations through the diversity of ice cream flavours was an immediate draw. Our aim was to combine the flavours with the features and symbols of Bled and so we ended up with three final flavours – Alpine beauty, Brainpower boost and Original Bled Cream Cake. We played with fresh herbs, superfoods and natural ingredients to make the flavours healthy and satisfying. In order personalize the story, we recruited an ice cream master who is a local Bled resident himself, and included also our hotel director in the promotion. A lot of attention was paid to the presentation of the ice cream, making sure it was unique, different and green. How did we obtain votes? Sava Turizem is the largest tourist company in Slovenia and this project was aimed at additionally raising affiliation within the company. Our employees from across Slovenia felt like being part of the story and shared it on social networks and spread the news directly to their business partners, friends and acquaintances. Information boards in Bled pointed out Lake Lounge as place to taste the three competing ice cream flavours to the walk-by visitors. And also hotel guests were keenly interested in how we were rating, as in the last few weeks the situation with the three leading competitors, the Americans, Czechs and us, was rather tight and exciting. The 3rd best ice cream in the world also sounds attention-grabbing, doesn’t it? 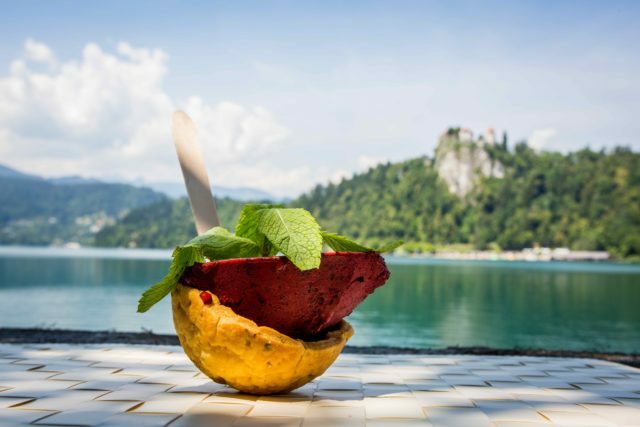 It surely does to Slovenian daily visitors to Bled, as ice cream sales in our cafes increased substantially compared to last year. It also does to the Slovenian media, as both TV and printed publications reported about us. We even organised an ice-cream networking event for business partners and friends of Sava and now we offer these three flavours instead of a conventional dessert to organisers, who choose our hotels as their event venue. One concrete example of presenting our winning flavours as a part of a lunch was within a Bled Strategic Forum – Tourism Panel when a distinguished guest, Mr. Taleb Rifai, Secretary-General of the WTO himself, complimented the originality and freshness of the story and flavours. To sum up, I completely agree with Mr. Čad that a social campaign cannot compensate for a lack of quality in a product. And YES, a good ice cream does not need “Miss – title holders” to (repeatedly) personally address event organisers to give it a try. However, I believe that at a given moment you need to make the most out of it– in our case, the fun ice cream game turned into a series of campaigns and definitely lead to an upgrade- both of our offer and of communication. Q: What time do you like to be at your desk? I am quite an extravert who enjoys socializing, networking, meeting new people, exploring the market… so my favourite time is definitely away from my office J. But despite being so passionate about what is going on in the outside world, I find productive time at the desk crucial in order to meet with my colleagues, sharpen the saws, plan more strategic moves and to do the needed paperwork. I can also call myself very privileged working within a group of 14 hotels, so my office can be in the alpine gem of Bled one day, ancient Ptuj another or the charming Prekmurje on a third. Beside the generally known management practices, especially delegating wisely to develop the employees’ confidence, encouraging fluid two-way communication and recognizing the team’s achievements, my advice would be not to forget to play. We are working in such an amazing industry with numerous possibilities to grow personally and professionally, so sometimes encouraging a team to reflect that feeling, smile and have fun is the best tactic. Depending on how I feel at the particular moment, I like to have several different books on my night shelf ready to read – from relaxed romance boosting the imagination to more educational books about personal or professional development. Recently I just finished a very powerful book entitled “Start with Why” by Simon Sinek, exploring what separates great companies and great leaders from the rest. The author suggests using a “Why” concept to be more innovative, successful, influential and profitable. “Why Slovenia and why Bled” are also the top priority issues to focus on when we are confronting potential clients. The book “Start with why” is actually very applicable to the hospitality industry itself, pointing out that only seeing what most others can’t see and providing things clients would never think of asking for makes the difference between the best and the average.